I spent 2 weeks studying Spanish with HablaYa in Panama. The first week was in Panama City and the second in Bocas del Toro. If you are thinking of studying with HablaYa, read this first to know what to really expect from your experience. Here, I talk honestly about the teachers, about the home stay and if I would recommend it to other students. I also included a bit about how I was treated after telling them that I had to leave a day early. Read right to the bottom to find out what happened. Classes Overall - I learnt a lot and can understand way more than I could to begin with. I can also introduce myself and say a couple of sentences. Home Stay Overall - Probably not worth the money. We paid around $500 for 2 of us each week. We could have spent less money in Airbnbs or hotels and bought food. I started my classes knowing basic Spanish. I have done a couple of the lessons on Duolingo so know how to say "los hombres" and "los gatos beben leche" etc. But I never learnt how to introduce myself properly or how to say numbers etc. I had Katherine (I think that was her name) as my teacher, who, although she was friendly and knowledgeable, did annoy me quite a bit during our week of lessons. She often brushed her hair, looked at her phone during class rather than concentrating on teaching me and even ate chocolate one morning. She helped when I needed it and was good at explaining things, but as a paying student, I shouldn't have to ask the teacher not to use her phone. I literally said to her "Can we do something..?" - to which she looked at me blankly, so in my broken Spanish, I said "tu, telefono, non.." and tapped on my book. She got the point, but still got her phone out later that same lesson. The first day I let it slide and I thought there must be something seriously wrong if she is using her phone while she is meant to be teaching, but no, it carried on throughout the whole week. The classes were ok. She would explain something to me, writing examples on the board, then we would maybe watch a video about it, do a worksheet then move onto something else. I learnt a lot during the week so I can't complain too much, but it seemed quite unorganised. We would swap from 1 subject to another with no real connection between the two. She would spend time looking for YouTube videos, which were played rather quietly, and then she would mess with papers or brush her hair so I couldn't hear the video properly. She gave me a worksheet with colours on it that was printed in black and white (what?!). Then, some of the words weren't on the sheet of paper, and of the ones that were, some of the words apparently weren't even correct Spanish. This is what I mean by unorganised. Why is this worksheet still being used if half of it was crap and had to be changed? I don't know. When I lived in Paris, I had group French lessons and although I've never had private lessons before, it didn't really live up to my expectations. I wanted to do a lot, learn as much as possible, but it seemed like my teacher wanted an easy life and worked through things quite slowly. It also seemed like the homework was always a bit of an after thought. Would I recommend Private HablaYa Spanish classes in Panama City? I don't know. Maybe if you would have another teacher, or if you are more laid back than I was. I just didn't like paying so much per hour waiting for someone to find the correct video on YouTube to show me, which then I couldn't hear anyway due to her rustling around. I booked a home stay through HablaYa and stayed with a lovely woman called Deborah. She was nice and welcoming but again, didn't meet our expectations for several reasons. We paid $50 extra per person ($100 total) to have 2 meals per day for a week. We did this thinking we could help with preparing the food, thus practicing our Spanish vocab. We thought we would eat with our host family and get to know them as well as practicing our conversational Spanish. But, even though she was lovely, we didn't see much of her. The meals were very basic. Breakfast was a small bowl of mixed cereals (fruit, oats, nuts.. that kind of thing) with milk. And dinner varied between rice with fish & salad to a single small burger. One day we had a small portion of pasta which tasted of nothing so we went to bed hungry. I wouldn't mind if the food was crap but we were with her, talking, learning & practicing etc. Or if the food was amazing and worth the money even if we didn't see her. But when you're paying $500 for accommodation & food, we expected either company and conversations or decent food.. or both!! The house was nice and we had our own room, but it was far away from anything to do, so in the evenings we didn't do much at all. When we had stayed in Casco Viejo the week before, we were out every evening walking around and exploring this city. But staying in Deborah's house meant we had dinner at 6pm then didn't really do anything exciting after that as we didn't want to pay for lots of taxis etc. It's a shame that where she lived was so residential and not ideal for tourists. The good thing about Deborah's house and her rules was that we could use the kitchen as we wanted. This meant we could cook food for lunch without any restrictions. I've got to say, week 2 was a lot better. I was in a group class with 4 other students, all of which knew the same amount of Spanish as me. Our teacher was Kirshiana who was very friendly and bubbly and made learning the language fun. She spoke to us only in Spanish, apart from when we really didn't understand. She would then quickly explain in English. Which is exactly what we needed. The teacher I had for the first week would go onto the next subject, even if I didn't understand what she was telling me. Kirshiana skipped between subjects sometimes and we didn't always see the correlation between the subjects covered. However, what we did do was very useful and helped in day to day life. We had homework everyday which was good as it made me go over what we had done that day and revise. However, we didn't always go over the homework the next day to check if it was ok. When giving us homework, she often just spouted off several pages, without writing them down herself, so the next day she didn't know what to check with us. One day for example we had to do a work sheet for homework, and the next she didn't go over it. So at the end of the class I asked if we could go over it the next day as I wanted to know if I had understood or not, and the next day she didn't go over it - even though I had asked. Another day we had to write a paragraph about something, and again, the next day we didn't go over it. I would have been good to have the homework checked to know that what I had written was correct and therefor I had understood it. Kirshiana also used her phone to play on games several times whilst teaching us in class. I don't know why the teachers think this is ok when you have paying students in your class? Maybe its a cultural thing but either way it wasn't very professional and I would advise that HablaYa talk to their staff about the use on phones in their class. I felt like this week was slightly unorganised for several reasons. Like I said, we didn't always check homework (even when I asked), we jumped between subjects that weren't related, but also our teacher didn't know what we had done the week before. She would ask us to go to a certain page in the book and we had done it the week before. I feel like she should know before the start of the week everything that we had covered the week before as not to waste time. But also so that she knew our level of Spanish and what we should be doing next. Overall though, I think Kirshiana did well. She was fun to learn with, she spoke English when we needed her to and she made sure we understood what was being taught to us. The home stay in Bocas del Toro (which was organised through HablaYa) was so much better than the first week. We stayed with the family Morales who were very welcoming and nice to live with. The dad of the family was the one we spoke with the most. He made the effort everyday to talk to us in Spanish, to ask questions and to help us when we struggled with words etc. He lived in the house with his wife, daughter and niece. The 3 women didn't talk to us much but that was ok. At least there was Adrian who made the effort. The house was close to the centre of town which meant that it was easy to visit the shops and restaurants etc. The downside to this family was that we were not allowed to cook anything for our lunches. We could make salads etc but couldn't use the oven or stove which limited what we could make. The food was a lot better in this house as we had fruit, big portions and a nice variety. It was nice that Adrian sat with us for every meal and spoke to us about our day and about life in Bocas. I felt like my Spanish improved by listening to him talking and I could practice what I had learnt in class with him. They have 2 rooms for students in their house and the other student was a German woman who had been there for several weeks. This meant that there was 4 of us at the table and another person to learn from. I am glad that this home stay was a lot better than the first, but I still don't think it is worth the money. Overall would I recommend HablaYa? I don't know. I would not recommend my teacher or home stay the first week. Both were really expensive and didn't live up to expectations. But, the teacher (although not perfect) and home stay of the second week were good. I think you will be lucky or unlucky with who you have as a teacher and who you stay with, which isn't very reliable. I can't 100% recommend HablaYa because my experience of week 1 is totally different to my experience of week 2. If HablaYa can have some sort of consistency with their teachers and home stays, maybe then I would recommend them, but for now, maybe not. The last thing which I guess is a little unfortunate but I didn't like how it was handled was my last day in Bocas. I had to come back to Europe urgently so had to miss my last day of class and also 2 or 3 nights in the home stay. I told them about a week in advance over email but they told me to talk to someone at the school when I was there. So the Monday, I went in and spoke to the guys at reception. One of them told me that I will be able to have a 2 hour private lesson to make up for the day that I will be missing (as 4 hours group lessons equates to 2 hours private lessons). He said to come in the next day and ask again about availability. But the next day he wasn't in, so I asked the other guy at reception. He told me the same sort of thing and to come back at lunch time. Then at lunchtime he said to come back the next day and ask again. I told him that I was only really available this afternoon or tomorrow afternoon as I travel back Thursday afternoon. He said he would text me if there was a space available and if not to go in the next morning. So Wednesday morning I went back to reception and asked again, he said to come back at lunch as they still haven't organised times etc. When I went back at lunch time he seemed annoyed at me that I kept asking - even though both him and the other receptionist kept telling me to come back and ask. And he spoke to me in a very rude manner saying "I don't know why he told you that you could have private lessons, as that isn't possible. He shouldn't have said that to you. You obviously didn't read the terms & conditions about cancelling did you? You can't just cancel the home stay and last day of lessons and expect private lessons and a refund. I've already paid the home stay so can't ask for money back. And you can't have a 2 hour private lesson. I don't know why you keep asking?" And although that doesn't sound that bad, it was the way he spoke to me that I didn't like. Especially after he had kept telling me to come back and that he will look at availability for me to have a private lesson. The way it was handled was really unprofessional and should have been cleared up either via email the week before, or on the Monday. I shouldn't have felt like I had to keep asking and then to be spoken to in a rude manner when I did ask. I don't think the situation was handled well at all and made me feel really uncomfortable about being there. I hope if they read this, they will take this into consideration next time someone has a similar situation. I had to go back for a visa reason, but imagine if it was something more serious like a death in the family, and having to be spoken to like that, as if I had planned on cancelling last minute just to annoy everyone?! I wrote this blog post with the intention of telling other potential customers my experience with HablaYa. I didn't write it to cause an argument, get into trouble or get a refund. I wanted them to see what had happened and improve their services. I wanted them to take this information and inform their teachers that certain behaviour was not acceptable eg. eating in class, using the phone in class or not being organised & checking homework etc. I emailed HablaYa telling them that I had written this post and told them that I thought it would be useful for the managers to read it as to improve future students' experiences. They emailed back asking me to take down the post as it will harm their reputation. They said that everyone else has had great experiences with them and that my experience was unusual and doesn't reflect them as a company. They apologised for the things I wasn't happy with and understood why I wasn't 100% satisfied. With that they offered me a refund of 50% of my first week in Panama City for both the classes and the homestay. They also gave me the money back for the day I missed in Bocas. Although I didn't expect a refund, I now think I am being treated fairly and am receiving the compensation I deserve. The staff at HablaYa have taken my post seriously and are hopefully working towards improving as a company. I was told that the teacher from the 1st week will be sacked for her behaviour in class. Although I feel bad that she will lose her job, it wasn't my fault that she behaved in that way and if she had done her job properly, I wouldn't have complained in the first place. I am pleased to say that HablaYa have done everything to try to improve the situation and my views of them as a company. They have been very apologetic and seem shocked that my experience was like this. I truly hope that my experience was an unlucky one and that anyone booking with them in the future will have great teachers and brilliant home stays. I am very sorry your experience in my land wasn’t as pleasant as it should had been. I have no relation to ” habla ya” but just that name is right as rude as they acted. I hope, more people read your post and avoid to book with them juat for them to know that when they do this kind of things just for the money, they not affect people but also affect our country image. If you ever come back to Panama, don’t hesitate to look for real Panamaniams willing to welcome you and hablar Espanol for free. I loved the rest of Panama and would love to go back! We visited the San Blas ilands, Casco viejo, Bocas, Bastimentos etc and had really great experiences. 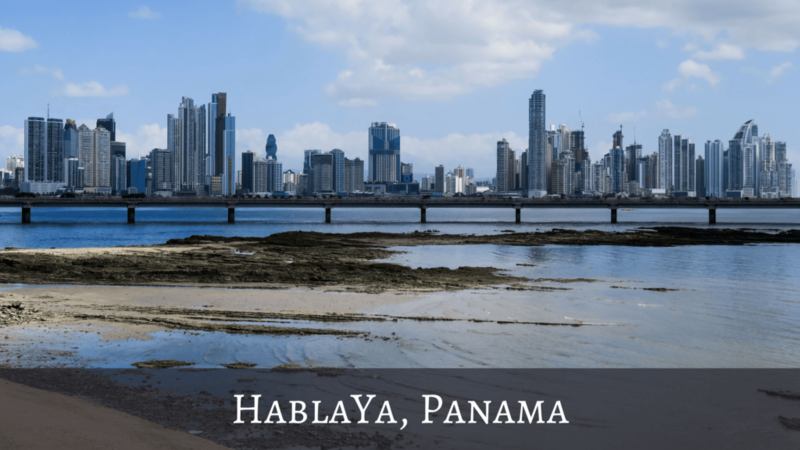 Don’t worry – HablaYa has not put me off Panama at all! If you’re interested, I have written other posts about the places I enjoyed! They might be fun for you to read about from a tourists point of view! I’m glad you didn’t judge the book by its cover. I am sure enjoying your experiences in places of my country I still have to visit. I spent for 5 months at Habla Ya. Three teachers and Anna was the only one who really help me. I did have Sylvia one day because Anna was out. But Ashley went to fast and a guy I had for two weeks only wanted to congregate verbs. Unless you get Anna, I wouldn’t recommend it. Hey! I’m glad I wasn’t the only one who had problems with their teachers and approach etc. Did you speak to HablaYa about your experiences, concerns and frustration? I would recommend you do so that they know I was not the only one. They seemed shocked at what I had written and said they had never had a bad review before. I think a lot of people (maybe yourself included?) are too kind to complain! Anyway, I’m sorry you didn’t have the best experience either! What a shame!